Puritan & Company, the modern-American dining destination from much-lauded Cambridge-based chef, Will Gilson, pays homage to local history and Gilson’s deep New England roots. Named for the Puritan Cake Company, which once occupied the same spot and Gilson’s Pilgrim ancestors (he is a thirteenth generation Mayflower descendant), the Inman Square restaurant creates an urban farmhouse vibe with potted herbs and heirlooms from his family’s farm in Groton. Communal tables add to the convivial, dinner partyesque atmosphere. Open for dinner seven nights a week, Puritan & Co. features seasonal, fresh, farm-to-table fare that’s deeply rooted in New England tradition, yet executed with Gilson’s signature modern American style – oven-fresh potato Parker House rolls and Moxie-braised lamb belly, for example. The beer-and-wine beverage program balances local craft beers and house-made vermouth with wines from all across the globe, including a range of organic and biodynamic selections. Chef Will Gilson began his career at age 15, when he apprenticed with Chef Charles Draghi at Marcuccio’s in the North End. He completed his formal culinary arts training at Johnson & Wales University in Providence, RI, where his expert wine knowledge won him the 2004 R.C. Knopf Student Achievement Scholarship, which funded a three-month tour of wineries in Napa Valley, Venice and Paris. Gilson has had stages at Oleana in Inman Square, Silks at the Stonehedge Inn outside of Lowell, and at the restaurant of London’s most exclusive hotel, The Lanesborough. 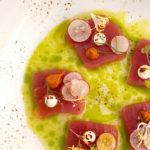 Gilson began making his name in the Boston area in 2007, when he opened the Garden at the Cellar, a mid-priced restaurant that quickly built up a large following in Cambridge. He left in 2011, as a leader on the forefront of the pop-up restaurant movement in Boston, to introduce a series of successful restaurant ventures, including Eat @ Adrian’s located on the Cape during Summer 2011. However, it was at the Herb Lyceum at his family farm in Groton, where farm to table cooking truly became second nature for the burgeoning chef. Gilson was only 17 years old when he began cooking there, and the experience set the foundation for his appreciation for farm fresh produce and the merit of seasonal cooking. Gilson’s time at the Herb Lyceum has molded the direction of Puritan & Co., where guests will find touches of his familial hospitality and their passion for herbs sprinkled throughout their experience. It is here that Gilson introduces his dream of owning a refined yet rustic neighborhood restaurant starring the farmer’s market fare he grew up with as a local farmer’s son has become a reality. In his spare time, Gilson can be found tending to his labor of love for making charcuterie and uploading photos to Instagram that showcase his travels to food cities. He is an avid reader of vintage cookbooks and has amassed a lively Twitter following that includes the local Boston area press. He believes wild boar is underappreciated and his favorite vegetable is the parsnip. He is not above restaurant hopping in a pig costume should the occasion so require.